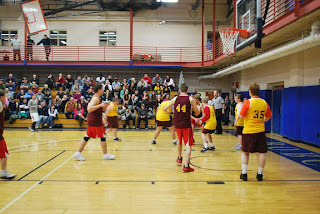 On February 17, 2013, members of the Pittsburgh Police played a scrimmage game against the JCC Special Olympics PA (SOPA)—Allegheny County Basketball Team at the Jewish Community Center in Pittsburgh. This is the second year that the Pittsburgh Police have scrimmaged the JCC 5x5 team in preparation of the SOPA-Allegheny County tournament at the University of Pittsburgh on March 9th. Special thanks to our officers for volunteering their time and energy to help prepare the JCC for their tournament (Scott Schubert, Mike Mares, Jeff Brock, Melissa Gutch, Rick Howe, Glenn Aldridge, Frand Rende and his son Dino). Special thanks to Jim Glick for taking photos for both teams. On Saturday, January 26th, the University of Pittsburgh at Greensburg hosted their second annual SOPA Hoops Saturday. During halftime of the men’s game, athletes from Special Olympics PA’s (SOPA) Westmoreland County program competes in an exhibition game. The Gym was packed and both students and athlete families cheered like crazy for our athletes. The event was co-sponsored by Pitt-Greensburg’s Student-Athlete Advisory Committee (SAAC) and Student Pennsylvania State Education Association (SPSEA). In addition to the basketball games, there was a concession stand, 50/50 raffle, and Chinese auction. The event raised over $1,400.00. All proceeds (ticket sales, 50/50, concession stand, and Chinese auction) benefit Westmoreland County. Last year $1,230.00 was raised at the one-day event. 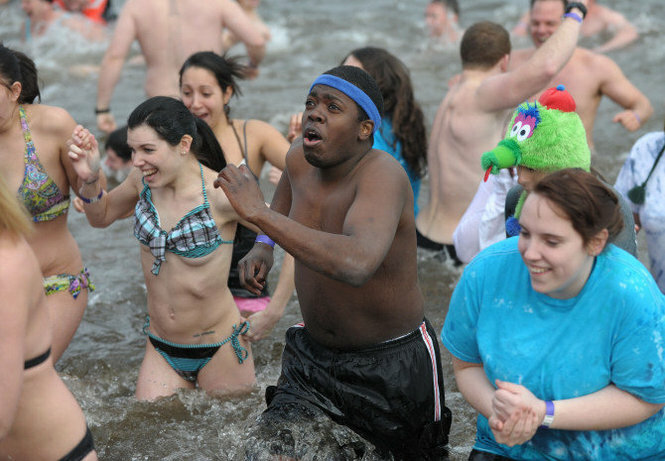 Over 1,000 spectators watched 641 plungers enter the Delaware River in Easton, PA for the first Annual Lehigh Valley Polar Plunge on January 19, 2013. The plunge featured boxing legend Larry Holmes and NBA star Darryl Dawkins taking the mic at Scott Park in Easton. The MC of the event was news anchor Jaccii Farris. Many of the plungers were part of teams that dressed in matching costumes and some plungers dressed in their own inspirational outfits. There were team tailgates and tents sprawled acrossed the park and a DJ played for all to dance and have a good time. Plunge Town featured Dunkin Donuts, Just Born and Keystone Snacks. To enter the plunge, each individual had to raise $50.00 to plunge or to be "Too Chicken for Dippin". Many individuals received sponsors from their family and friends. 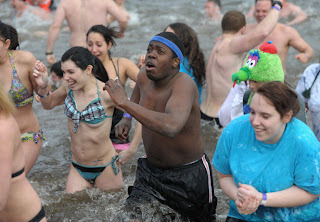 The city of Easton was a gracious host and invited Special Olympics back to plunge again next year on January 18, 2014. The first plunge was a huge success raising $91,000.00. The local programs that participated in the event were: Northampton County, Monroe County, Carbon County, Columbia-Montor, Lancaster County and Bethlehem City. On January 25, 2013, the United States Department of Education (DOE) released new guidance to schools and school systems throughout the nation that receive federal aid about the requirements of providing quality sports opportunities for students with disabilities. While the guidance does not make new law, it does identify the responsibilities that schools and school systems have under section 504 of the Rehabilitation Act. This guidance aims not just to protect rights but to promote unity and has instantly given inclusive sports more relevancy and focus in schools. The guidance also suggests that all students, not just those who join a sports team, should be exposed to the health, fitness, and nutrition benefits of physical activity. As a statewide sports organization already serving both disabled and non-disabled students through our Unified Sports ® and Project UNIFY programs, SOPA stands ready to serve as a partner and a solution provider. 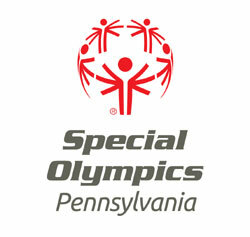 The specific call out to “allied” or “unified” sports is especially encouraging, as this is already part of what Special Olympics Pennsylvania (SOPA) offers. Special Olympics Unified Sports ®, an inclusive sports program that combines approximately equal numbers of individuals with intellectual disabilities and partners without intellectual disabilities on teams for training and competition, is a significantly growing program that has directly resulted in building more inclusive school climates. Project UNIFY® is also an obvious solution to this directive. 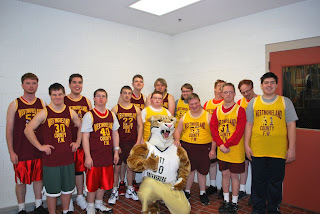 Project UNIFY, a Special Olympics program supported by Department of Education funding, uses inclusive sports activities (Unified Sports) along with youth leadership and activation activities to provide all students with opportunities for participation and acceptance. SOPA’s Philadelphia program, in partnership with the School District of Philadelphia, has already made great strides in providing platforms through Project UNIFY® for Philadelphia youth to understand and value their peers with intellectual disabilities and empower and activate them to create opportunities for sport, friendship and advocacy. Based upon our own experience here in PA as well as the successes of Special Olympics programs in other states, SOPA has a variety of tools, models, training and options that can help schools get their equitable sports programming up and running. To obtain additional information or inquire about how Special Olympics might partner with your school or district, please contact Clare Walsh Miller at cwalshmiller@specialolympicspa.org.